While it may be hard enough to get ourselves to maintain a healthy diet while on vacation, ensuring that our children stick to one can be quite the challenge. It is common for children to consume lots of processed snacks and restaurant comfort foods while on vacation. However, with some planning and creativity, a vacation can easily turn into a learning experience for kids to try new foods and gain an understanding of what healthy options they can choose from when they are away from home. Plan ahead. Look up restaurants online ahead of time and plan where you are going to eat. Going to restaurants that you know offer healthy options is more beneficial than driving around looking for places to eat. Limit soda intake. Order water for everyone at the table. To make it more interesting, you can ask for lemon and lime slices on the side for kids to add to their glasses to make their own infused water. By allowing them to create their own drinks, they may be more encouraged to drink more water. Pack your own travel snacks. Provide options for your children so they do not feel restricted with only one kind of snack. Giving them the power to choose between healthy snacks will give them more of a sense of satisfaction with the snacks you have provided. If you have to stop somewhere to buy snacks, pick a few healthier options like nuts, fresh fruit, popcorn, and whole grain pretzels for them to choose from. That way, they won’t head straight for the potato chips, but will still be happy to have the opportunity to choose which snacks they would prefer. Create some ground rules. Maybe a rule you set is that your children have one treat per day. Making the treat something specific to the locale you are in (like clam chowder bread bowls in San Francisco) makes the treat particularly special and not something they will be able to desire daily. Perhaps the rule could be ‘one sweet drink per day’. Instead of water, your children may be able to order a small serving of chocolate milk or juice during one meal. Setting up rules ahead of time lets your children know what to expect so they are not surprised if you put limits on what they are allowed to order. Focus on new foods. Check out the lacl cuisine before you get to your destination. Children are more open to trying new foods while they are visiting new locations. Introducing them to new healthy foods (like kale or salmon) while on vacation can instill a lasting preference for those foods later on. 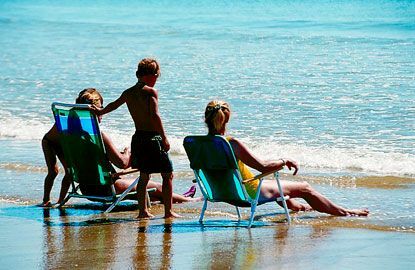 Family vacations are about enjoying time spent with loved ones and having fun. Though it won’t hurt to have a treat once in a while, setting good guidelines and examples for your children can instill good habits, whether they are on the beach or at home.